Despite being one of the most commonly used drugs, the molecular mechanism of action of the anthelmintic praziquantel remains unknown. There are some unusual features of this drug. Critically, widespread resistance to praziquantel has not developed despite decades of use. Here, we set out some challenges in praziquantel research and propose some provocative hypotheses to address these. We suggest that praziquantel may have multiple pharmacologically relevant targets and the effects on these may synergise to produce an overall, detrimental effect on the parasite. Praziquantel also acts on a number of host proteins and we propose that these actions are important in the drug’s overall mechanism. Although the drug is largely used in the treatment of human and domestic animal worm infections, there is a considerable “grey literature” along with some academic studies which may have been overlooked. It appears that praziquantel may be effective against hydra. It may also be effective against some unicellular parasites such as Giardia spp. Further, scientific work on these understudied areas may be useful in understanding the molecular mechanism in Trematoda. The lack of widespread resistance suggests that praziquantel may act, at least in part, on a protein-protein interaction. Altered drug metabolism or enhanced drug efflux are the most likely ways resistance may arise. There is a critical need to understand the biochemical pharmacology of this drug in order to inform the discovery of the next generation of anthelmintic drugs. Keywords: Neglected tropical disease, Drug mechanism, Schistosomiasis, Schistosoma spp., Calcium homeostasis, Praziquantel. Keywords:Neglected tropical disease, Drug mechanism, Schistosomiasis, Schistosoma spp., Calcium homeostasis, Praziquantel. Abstract:Despite being one of the most commonly used drugs, the molecular mechanism of action of the anthelmintic praziquantel remains unknown. There are some unusual features of this drug. Critically, widespread resistance to praziquantel has not developed despite decades of use. Here, we set out some challenges in praziquantel research and propose some provocative hypotheses to address these. We suggest that praziquantel may have multiple pharmacologically relevant targets and the effects on these may synergise to produce an overall, detrimental effect on the parasite. 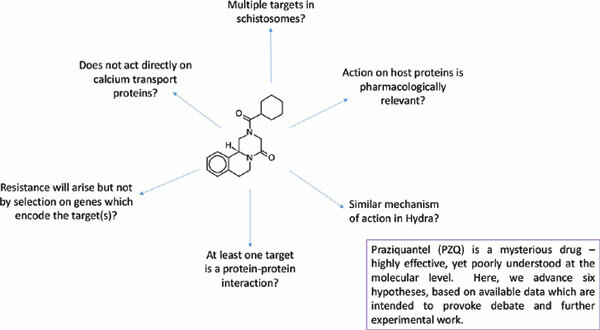 Praziquantel also acts on a number of host proteins and we propose that these actions are important in the drug’s overall mechanism. Although the drug is largely used in the treatment of human and domestic animal worm infections, there is a considerable “grey literature” along with some academic studies which may have been overlooked. It appears that praziquantel may be effective against hydra. It may also be effective against some unicellular parasites such as Giardia spp. Further, scientific work on these understudied areas may be useful in understanding the molecular mechanism in Trematoda. The lack of widespread resistance suggests that praziquantel may act, at least in part, on a protein-protein interaction. Altered drug metabolism or enhanced drug efflux are the most likely ways resistance may arise. There is a critical need to understand the biochemical pharmacology of this drug in order to inform the discovery of the next generation of anthelmintic drugs.